Since we’re talking grilled CHEESE, it’s important to include a few different choices. Have some classic selections such as an aged cheddar, but also be sure to venture outside the expected and try something new. Perhaps a soft cheese option such as brie and include a range of mild to bold flavours. If you’re lucky to live near a cheese shop such as The Cheese Boutique in Toronto, all the better! You already know that bacon makes everything taste better, right? 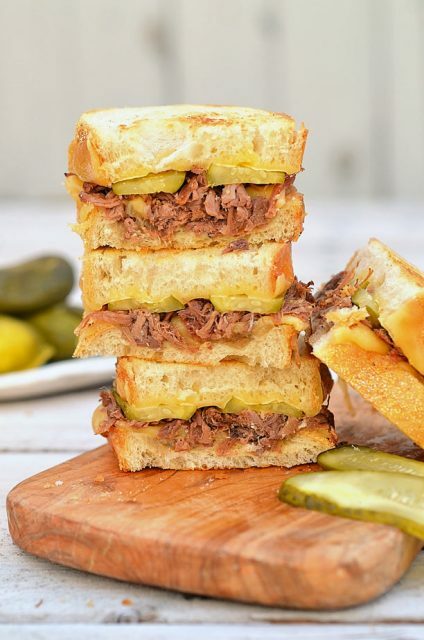 But, have you tried beef brisket on your sandwich? That’s what Chef Afrim Pristine uses for his signature Beef Brisket and Boerenkaas Gouda Grilled Cheese. An assorted tray of meats accomplishes two things at your party: 1) provides guests with a pre-dinner snack 2) adds another option for their sandwich-making pleasure. 3. Don’t forget your veggies! Veggies don’t belong on a grilled cheese sandwich, you say? We would have to strongly disagree! Greens go amazingly well on a grilled cheese, not to mention, peppers, onions, grilled mushrooms.. you name it! Once everyone has made their sandwiches, leftover greens and veggies can be tossed together in a homemade canola oil dressing and voila, your side salad dish is prepared! Ever heard of maillard reaction? It’s the reaction between sugars and proteins that occurs upon heating and that produces browning of some foods such as meats and bread (thanks, http://www.merriam-webster.com/). Have your guests brush their bread with canola oil before grilling to help with the browning effect and it will also give their sandwiches a nice crunch. If we’ve gone too far with adding meats and veggies to your grilled cheese, dare we suggest, sauce on your grilled cheese? 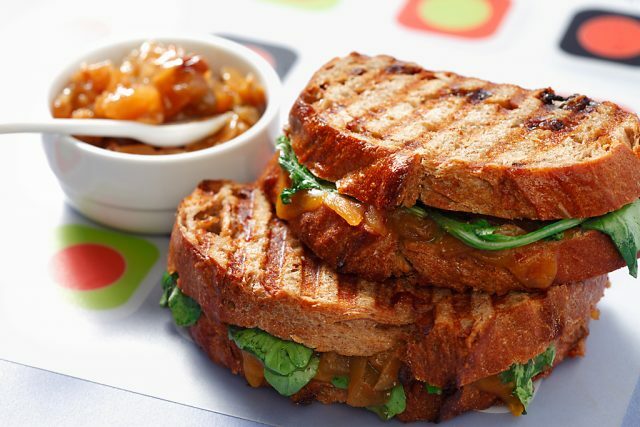 Our Ultimate Grilled Cheese includes an Apple Chutney that takes regular old cheddar on bread to the next level! A few mustards, jams and a homemade chutney for your guests to choose from is a nice touch! Bread is what gives the sandwich the right “chew”. A fresh French bread, a seedy multigrain or even a country raisin loaf are all excellent selections. 7. Be prepared for some creativity and serious competition.. and sharing! Friends quickly become competitors when faced with a challenge such as this one! Cut the sandwiches into threes or fours, if the bread allows so that there’s enough to taste one another’s creations. A prize for the best? That’s up to you! A grilled cheese is only complete with its other half, soup! Make ahead a creamy tomato soup or another favourite recipe to complement the sandwiches. Don’t be surprised to see your guests dipping their sandwiches in the bowls! That’s what it’s for. Need a little inspiration to kick-start the party? Watch the live video from our event where Chef Afrim Pristine, maître fromager (Cheese Master), demonstrated to our group the foundations of making a great sandwich. 10. Eat together and celebrate! As we often say, food tastes better with friends! Make this a time to laugh, share and enjoy one another’s company. Adapted from this post, April 2016. Canola oil to brush the outside. cheese and bacon and jalapeno peppers ! My ultimate grilled cheese is havarti with maple bbq pulled pork! You inspired me last year. These are now two of my favourites! 1. Pumpernickel bread, jalapeno cheese, thinly sliced figs, bacon, pickled jalapenos, red onion, with a little Smak Dab Mustard. 2. Rye bread, old cheddar, sauteed apples & red onions (in a little canola oil & maple syrup) & you guessed it – bacon! I love rye bread, old white cheddar and Mozzarella for stringiness, and a good layer of Sauerkraut. I love a grilled cheese with ham!! Soo yummy! I enjoy my grilled cheese pretty plain –cheese and bread, but I also like to dunk it into Salsa! I like my grilled cheese plain! Just cheese! Mine is simple with a hint of fire and a touch of the orient! A little Chopped Red Pepper makes it pretty and i love pretty food! I love a grilled cheese with crispy bacon and egg. Bacon, avacado! So so good! with cranberries, raisins, blueberries & sunflower. It’s like a holiday grilled cheese sandwich. Simple loaded bacon and cheese. 🙂 YUM! Cheese and bacon! So good! I am simple when it comes to grilled cheese, love old cheddar and bacon together. I love a good grilled cheese and ham sandwich! My favourite grilled cheese combo is cheddar cheese, onions and chili beans! Love making this sandwich! My favourite grilled cheese combo is cheddar cheese, onions, and bacon. Bread and cheese straight up with a side of ketchup. Less is more. My grilled cheese combo is just a classic grilled cheese with gouda and cheddar! My favourite combo is the classic – aged cheddar and good bread. I love a combo of cheddar and mozzarella cheese,hmm so good. Dipped in ketchup! I am very simple. I would like to do the grill cheese with Bacon Lettuce and tomatoe with cheese.. I would go with a tuna melt grilled cheese with real sliced cheddar cheese, mustard-mayo mix and pickles as a side. Love the contrasting flavours of this grilled cheese! I love grilled cheese and bacon with a side of tomato soup . I love making grilled cheese burgers – I barbecue hamburger (or veggie burger) patties then layer them between slices of bread with cheddar and Monterrey jack cheeses plus tomato, red onion, and jalapeno (and bacon on the non-veggie ones). Then just grill it like a regular grilled cheese sandwich. They’re so good. I like Mozzarella cheese with Salsa for my grilled cheese sandwich. i like it with tomatoes and onions! My favorite grilled cheese is cheddar and Spanish onion. I love grilled cheese with ham and tomato. My ultimate grilled cheese is made with Brie cheese and bacon, between slices of french bread. My favourite grilled cheese combo is cheddar cheese, Gouda cheese, Gruyère cheese and aged provolone cheese! It’s quite a bit of different cheeses so I don’t get to have it that often but it is my favourite ever! My favourite grilled cheese combo is harvarti, thinly sliced tomato, bacon, and spinach (and more harvarti). I love leftover turkey & stuffing on my grill cheese….yummy!! My fave combo is sourdough bread, thinly sliced tomato, jarlsberg cheese with turkey bacon! I love a BLT cheese. My favourite combo is Gruyère cheese, cheddar cheese, bacon, and tomato. I love cheese and bacon with mayo on the outside. My Mom loves to make a tomato and red onion grilled cheese sandwich – to tell you the truth, it’s very delicious ! I love making my grilled cheese relatively simple with sunflower flax bread, cheddar cheese & bacon with a side of dill pickles. Thanks so much for this chance to win & good luck everyone! My favorite is made with Swiss cheese and ham, garnished with a pickle. I’m a simple girl. Cheddar cheese and smoked ham. I love a cheese and bacon combo! I love, love brie cheese, sliced pear and a smearing of fig preservesor caramelized onions. All on a rustic, crusty bread. My ultimate grilled cheese combo is monterey jack cheese, tomato, a few pieces of baby spinach, and a little bit of crumbled feta cheese. We make the “No Cry Baby Grill Cheese” which we had for the first time at a quaint cafe in Napa California. It is made on a fresh Sourdough (or homemade walnut) bread with a thick slice of Gruyere cheese, one side of the bread has a thin layer of Apricot jam, and the final touch – baby arugula layered in between. Sweet, nutty and savoury! Serve with a bowl of Butternut Squash Soup for the perfect meal! Place all ingredients on sandwich together and fry on a med to low heat til cheese is melted in canola oil and sandwich is toasty golden and crispy! I like it with cheddar cheese and mushrooms! Butter outside of sandwich & Grill in fry pan. I like mine with onions and crispy bacon bits. My perfect grilled cheese is with thin sliced bacon, brie and basil! YUM! Sourdough bread, mozzarella cheese, pulled pork and sliced dill pickles. That’s how you make a grilled cheese sandwich! I love proscuitto, with mozzarella (buffalo or otherwise), tomato and basil. The grilled cheese that I like to make (and eat!) is made with bacon, cheddar and tomato. Pear and Brie on sourdough! I love grilled cheese with cheddar cheese, tomato, and bacon bits. I’m a traditionalist — just cheddar cheese like my Momma used to make. A mix of cheddar and mozzarella cheese, ham and dill pickles! I love a grilled cheese with ham!! I like thick sourdough bread, with relish, cheese some mayo. Homemade bread, cheddar cheese & bacon. 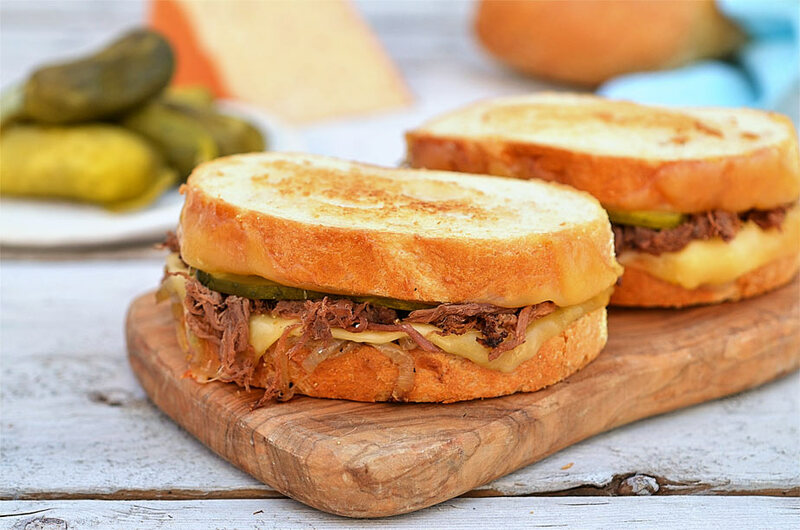 I love a grilled cheese sandwich with smoked meat, onions, jalapeno cheese with djon mustard. I love a BLT Grilled Cheese! I like a combo of cheddar and mozzarella, sometimes I add bacon too. I’d go for grilled cheese with lobster for a upscale lunch(glass of white chilled wine)….yum. I use mayo instead of butter, two slices of thick tuscan bread, 2 slices of Hot habenero cheese and 1 slice of white cheddar cheese and i add bacon and avocado. pure goodness. Twxas Toast with Velveetta Cheese and a tomato! I love my grilled cheese with Velveeta Cheese on wheat bread. My favourite Grilled Cheese Combo is a classic grilled cheese made with cheddar. I sometimes add grilled mushrooms and onions if I feel like having an extra special grilled cheese. Twelve Grain bread with yellow mustard, old Cheddar, crispy bacon . I’m pretty simple, and just go for a nice cheddar cheese on whole wheat bread. Favourite grilled cheese would be rye bread will cheddar, avocado, tomato and Italian seasoning. Always need the tomato soup on the side for dipping too. I am all about Grilled Cheese we eat them once a week with pea soup. The only thing ever the same is the soup! My grilled cheese is always a piece of artwork! I love adding sundried tomato or bacon and the cheeses are always different! Could be Swiss, Parm Cheddars, Asiago or whatever else is in the fridge! We don’t have a favourite! We do love our Grilled Cheese Nights!! Roast beef shaved or Montreal shaved beef and MNew , Bothwell Horseradish cheese. I like grilled cheese with tomato soup. I like it pretty simple most of the time … a nice cheddar with crisp bacon! Grilled chedder cheese on Rye Bread with bacon and tomato, and a dill on the side. I love a nice honey ham with a some delicious Extra aged Armstrong Cheddar cheese with a nice honey dijon mustard . Scrumptious ! for me its bacon/tomato/ham & cheese …mmmm feed me!! ilove grilled cheese, bacon and tomato sandwiches on gluten free toast! Italian bread, sharp cheddar, saute mushrooms and onions. I liked ham, cheese and tomato grilled sandwiches. fresh bread with blended cheese, ham and onion with a side of ketchup for dipping! My favorite grilled cheese is made with the black truffle Bothwell cheese. I add some bacon and some sliced pickles! My favourite grill cheese sandwich is with Tuscan ham, swiss cheese and pineapple on Italian Loaf! My favorite grilled cheese combo is black forest ham, turkey and swiss cheese on grilled french bread – yum ! Grille gouda cheese & green apple on thick sour dough! I love grilled cheese with sliced tomatoes and spring greens on grilled brioche bread.